MILWAUKEE (August 23, 2016) – More power. More comfort. More control. Today, Harley-Davidson redefined touring by unveiling the all-new Milwaukee-Eight™ engine, the ninth Big Twin in its history, plus all-new front and rear suspension for its Model Year 2017 Touring motorcycle lineup. power, the Milwaukee-Eight engine delivers better fuel economy compared to previous motorcycle models. Harley-Davidson Screamin’ Eagle® Performance will offer a range of new ECE-certified products for Touring models, including Street Cannon Slip-On Mufflers and Heavy Breather Performance, Ventilator and High-Flow Air Cleaners.In addition, the new Screamin’ Eagle® Milwaukee-Eight™ Stage I, II,III and IV kits enable riders in compliant countries to fully upgrade the performance of their bike to suit their riding style; from a passing power increase to a total engine upgrade delivering maximum performance (product compliance varies from market to market). Harley-Davidson® Custom Vehicle Operations™ (CVO) models combine prestige and performance in three limited-edition factory-custom motorcycles for 2017. ◾The 2017 CVO™ Limited model is enhanced by the refined performance of the new Twin-Cooled Milwaukee-Eight 114 engine and improved ride and handling provided by the new suspension. Also new for 2017 are Contrast Chrome Slicer wheels and a seat reshaped for rider comfort. 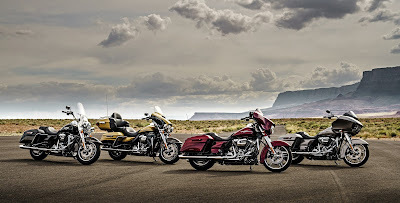 The CVO Limited also features a new custom paint scheme in four new colour combinations. ◾The 2017 CVO™ Street Glide® motorcycle combines the power of the new Twin-Cooled Milwaukee-Eight 114 engine, the refined ride and handling performance of the new suspension, and a four-speaker, 600-watt Boom! Audio system that delivers state-of-theart audio performance. Also new for 2017 are power locks for the saddlebags and fork controlled by a single security and locking key fob, and a re-styled seat cover. The CVO Street Glide is available in four new colour combinations for 2017. ◾The 2017 CVO™ Pro Street Breakout® motorcycle combines high-intensity performance with a long, muscular look steeped in drag-racing attitude. Utilizing cuttingedge finishes and textures, the CVO Pro Street Breakout brings a darker look to the CVO line. The CVO Pro Street Breakout is powered by the Screamin’ Eagle® Twin Cam 110B™ air-cooled V-Twin engine. Three finish choices include the new Starfire Black/Scorched Apple combination. With the High Output Twin Cam 103™ standard for all 2017 Softail® models and the S Series cruisers with the Screamin’ Eagle® Twin Cam 110™ engine, Harley-Davidson continues to offer its most powerful cruisers ever. To experience the transformation of the 2017 Harley-Davidson models for yourself, visit www.h-d.com/discovermore to schedule a test ride.